The name is what sold me on this pen. The Uni-ball Vision Elite. I'm expecting this pen to be 'Epic'. The name Vision Elite makes me feel like I should be prepared to be totally amazed by this pen, so I bought it to see if it lives up to it's name. The pen uses "Airplane safe technology" which sounds very posh. 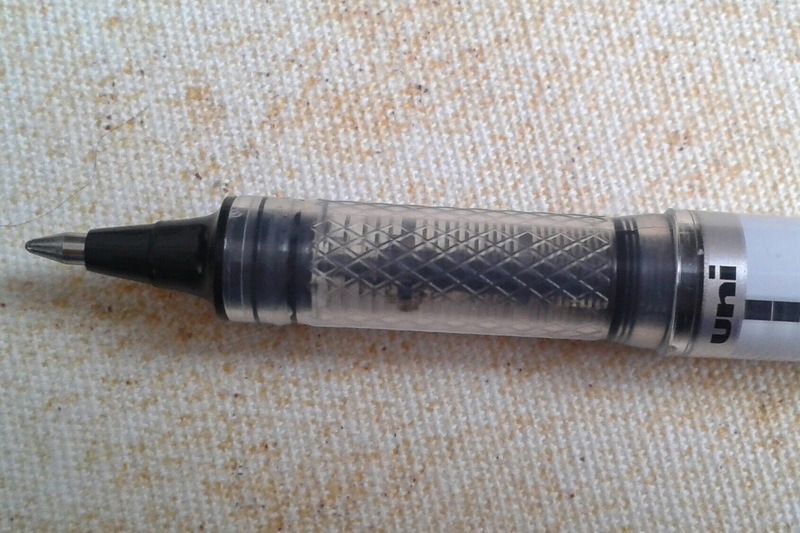 All this means is that the pen has a reservoir which absorbs expanding air preventing ink from being forced out due to changes in air pressure on a flight. So no in- flight leaks. I'm not a regular flyer and the idea that a pen might leak on a plane had never occurred to me until now. But if you are a jet setter, a leaky pen is something you no longer need to worry about. It looks very stylish for a plastic pen. I love how the colours slightly confuse me. Are the ends grey or silver? And there is no clear line where the colours change. They fade into each other beautifully. The lid ties in brilliantly with Airplane Safe Technology theme even if it was probably unintentional. The oval shaped windows, with not much to see when you look through them. I can almost see the faces peering out. And the top of the lid is like a futuristic cockpit, the pilots taking their passengers to an unexplored land filled with all things stationery. As amazing as the lid is, it doesn't post well. Unless you push it on with quite a bit of force it will just ping off, which can actually be quite fun for the childish pen fans out there. My son and I had a fun little competition to see who could ping it the furthest. The unimpressed hound ran for cover. As a lid itself it's very secure and trustworthy. The Uni-ball Vision Elite is super smooth to write with. The ink flow is flawless, not a single blip. Minimal pressure is all you need to get clear, crisp lines on paper. And if you are someone who presses hard, the result is exactly the same. I will just say that with this pen, the quality of the paper does make a difference. On my cheaper, rougher notepads I was getting alot of fuzziness. But when used on the right paper, this pen writes like a dream. I found that the smoother the paper, the better the writing experience. The ink dries fairly quickly, even on less absorbant paper and after 5 seconds max it's completely dry and smudge free. The ink did show through the page ever so slightly on the notebooks I used but nowhere near enough for it to be a problem. I could happily use both sides with no issues.The packaging says it uses "tamper proof uni super ink that will not wash off when immersed in water, acetone, glycerin, bleach or other chemicals used by document fraudsters". So document fraudsters beware. You will not get the better of this pen. The transparent grip with it's criss cross pattern serves it's purpose well. It's comfortable to hold despite being plastic. My fingers experienced no slippping at all. The Uni-ball Vision Elite is refillable and the refills are easy to get hold of online. 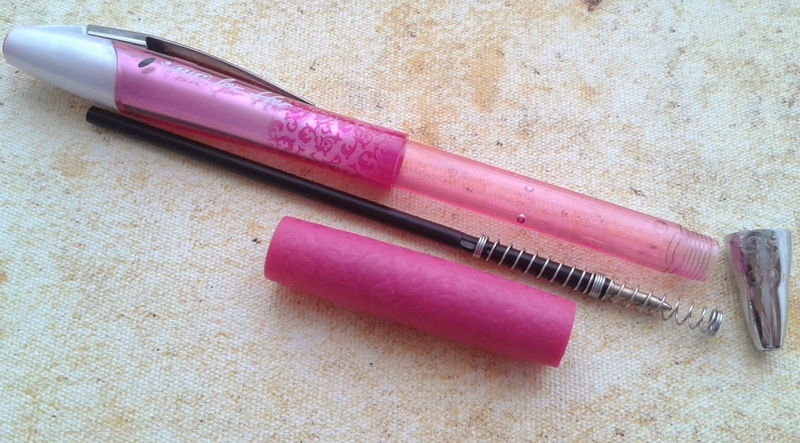 The refill is pretty much the whole pen, minus the case and lid. 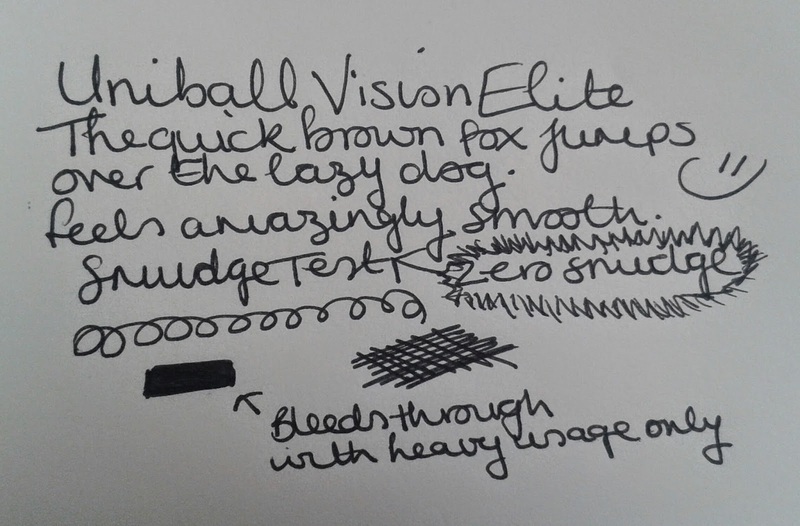 So is the Uni-ball Vision Elite as Epic as it sounds? Maybe not Epic, but it's close. 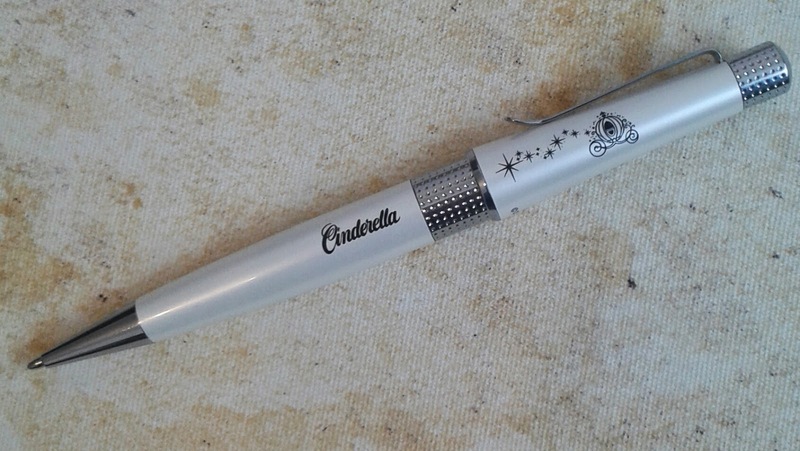 I would feel confident using this pen for important documents and forms, work assignments and pretty much everything else, as long as the paper is of a reasonably good quality. If you're a rollerball fan then this is a pen I would recommend trying for yourself. This is the Bic For Her ballpoint pen which I purchased quite a while ago now. The pen is plastic with a gorgeous rubber grip and a metal clip. It's retractable with a pink clicky button. This is one of the prettiest Bic pens I've used. Bic have really pushed the boat out where detail is concerned. 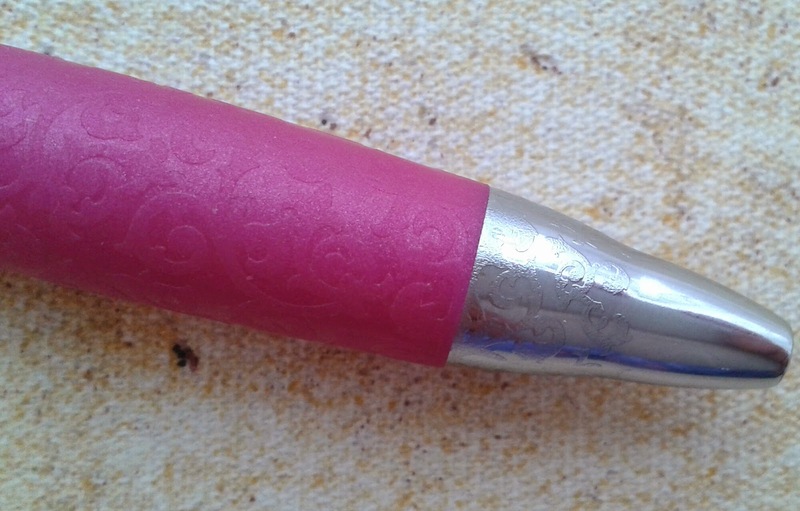 The beautiful swirly pattern runs all the way from the tip of the pen, through the rubber grip and up the barrel. The pen is slightly thicker than your average ballpoint and together with the comfortable grip and it's light weight, it feels great to hold. I do find that my fingers end up half on the grip and half on the tip as it's how I feel most in control, but it's not an issue. The slightly raised detail on the tip gives me enough extra grip to prevent any slipping. So it's not just a pretty face. The pen writes very smoothly. As I've said before, I don't like it when a pen is so smooth that it feels slippery on the paper and this Bic pen has got the balance just right. The Bic For Her uses oil based ink. If you click on the image above to enlarge it you will be able to see that I'm not getting consistent ink flow. It's not skipping completely but its definitely having a little trouble keeping up. It's not even noticeable unless you look really closely so I wouldn't really say its a big deal. There is no blobbing or gloopiness. I'm getting a nice clean line. The clip is strong and reliable. I always have a pen with me, whether attached to my clothing or in my bag so a clip I can trust is important. Otherwise the pen has to stay home. Refills for the Bic For Her are available to buy. To refill you simply unscrew at the tip and replace. Make sure you keep the spring as refills often come without them. Overall, I'd say I'm pleased with my purchase. The pen writes well, its comfortable, it's cute. Whenever the need for a pen arises, I wouldn't hesitate to pick up my Bic For Her. 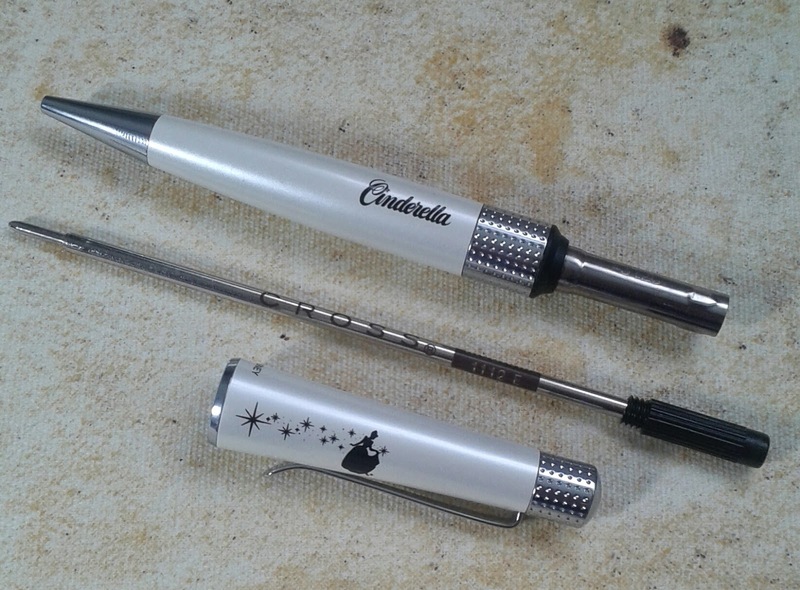 You may be aware that this pen has caused quite a stir, the "For Her" title being the reason. 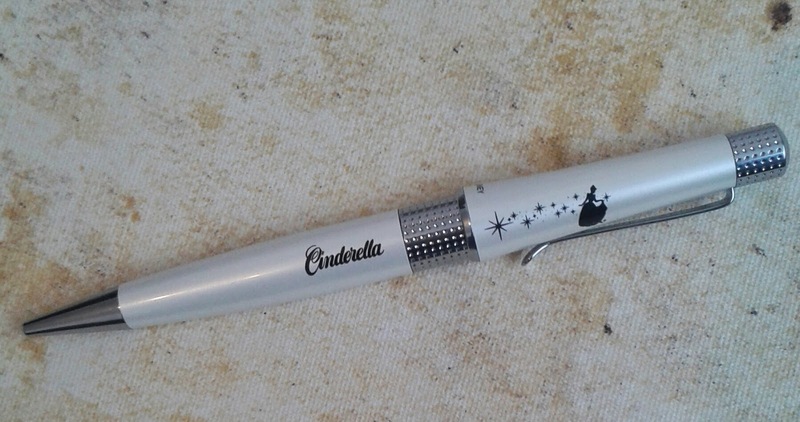 There were many very funny reviews posted online poking fun of this pen, some took a sarcastic approach and some were in my opinion way over the top. I can't even be bothered to jump onto that bandwagon as I really couldn't care less. I'm interested in the pen. How does it write? How does it feel? How does it look? I'm certainly not offended and if I was, I would simply choose not to buy it. One thing I will say is this, at least Bic can say they got people talking about their pens! 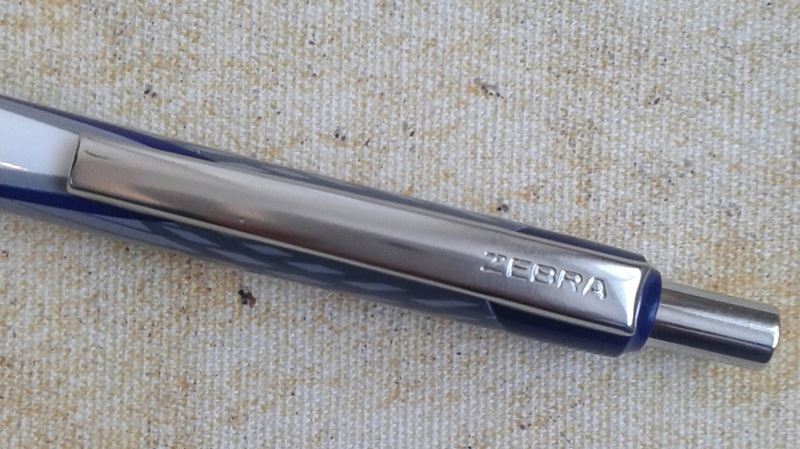 The Zebra Z Grip Flight is a ballpoint pen, made mainly from plastic with a rubber grip and a metal clip with Zebra etched into it. I love the design. The white and the rich blue really compliment each other. It's an attractive pen. It's lightweight and with the smooth rubber grip it's a very comfortable pen to hold, even for lengthy periods of time.The little dimples on the grip are pretty cute too. 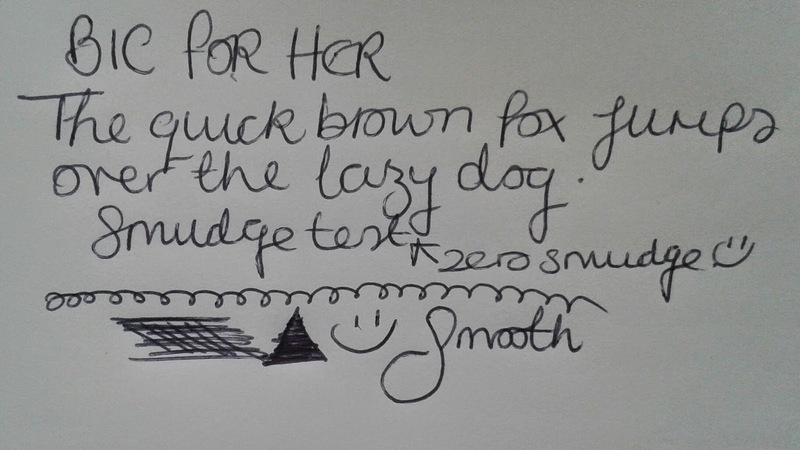 The pen uses low viscosity ink although to begin with I wasn't particularly impressed. The very first time I wrote, I found the pen left me with lots of thick blobs throughout my writing. My writing looked messy and the blobs took an age to dry. Yes the flow was consistent but it didn't look nice. There were two of these pens in the pack and both were the same. I gave the pens a really good shake and after a few paragraphs and lots of scribbles it began to look much better. Now that I have been using them for a couple of days the blobbing has stopped. 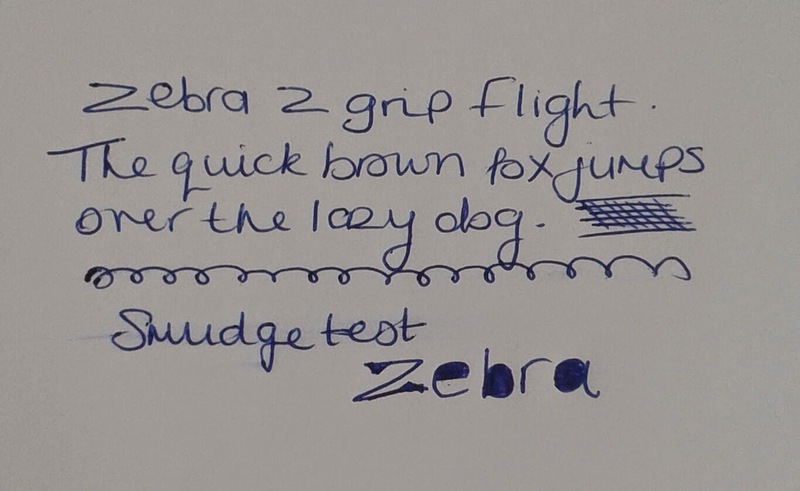 I'm getting a consistant and even flow of ink and I've had zero skipping so I've forgiven the Zebra Flight for it's little hiccup. The pen feels extremely smooth on paper. It's absolutely no effort at all to use. 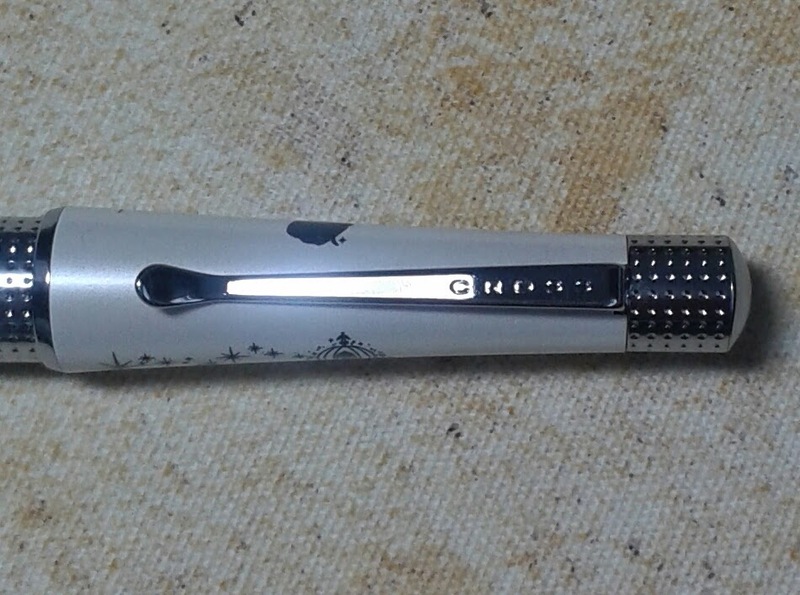 Dedicated refills are not available for this pen although you can refill it with a refill from another pen/brand if you wish. Refills of this size are widely available. I know some people like to mix and match with refills but I can't seem to bring myself to do it. Unless it's a refill specifically intended for that pen, I don't feel like its the same pen anymore. I've created something completely different and it just feels wrong. But the option is there for those of you who don't mind. I did get a slight smudge on the smudge test but it's not often I deliberately rub my finger across the words in that way so during normal use it should be ok. I'm a lefty and I didn't have any problems but I do write with my hand below my line of writing and turn my paper sideways slightly so I rarely smudge anyway. The ink didn't bleed through the page so I could happily use both sides without any issues. The clip is reliable and sturdy. It clips onto paper and pockets well, without sliding about or falling off. The only annoyance I have with this pen is the clicky button. When it's pushed in it rattles and slides in and out. It doesn't affect the use of the pen, I just find it annoying as I can sometimes hear it rattling as I'm writing. Its not a bad pen. It's not the best and it's by far not the worst I've used. 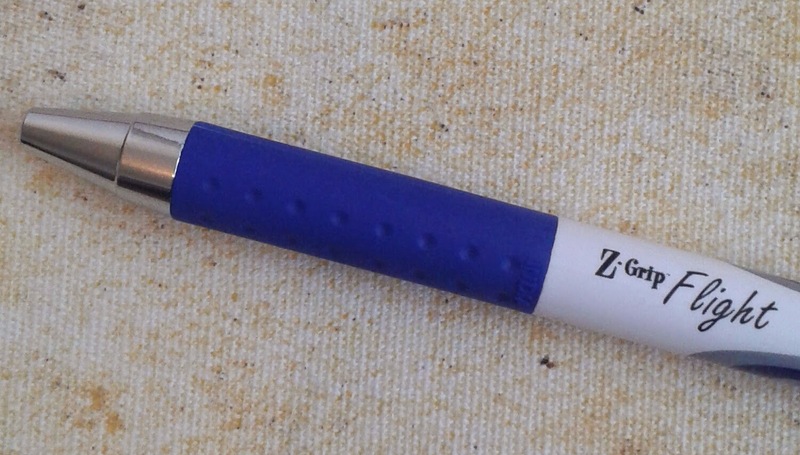 The Zebra Z Grip Flight is an everyday ballpoint that can handle everyday writing tasks with ease. I picked these pens up for £1.99 last week at B&M. They have recently expanded their stationery line and at the fantastic prices they offer I thought it would be rude not to test out the products. The trouble is I work there so I often find myself in the stationery isle after my shift to see whats new. I was drawn to the colours of these pens, thinking along the lines of crafting, cards, wedding invitations and scrap booking etc. 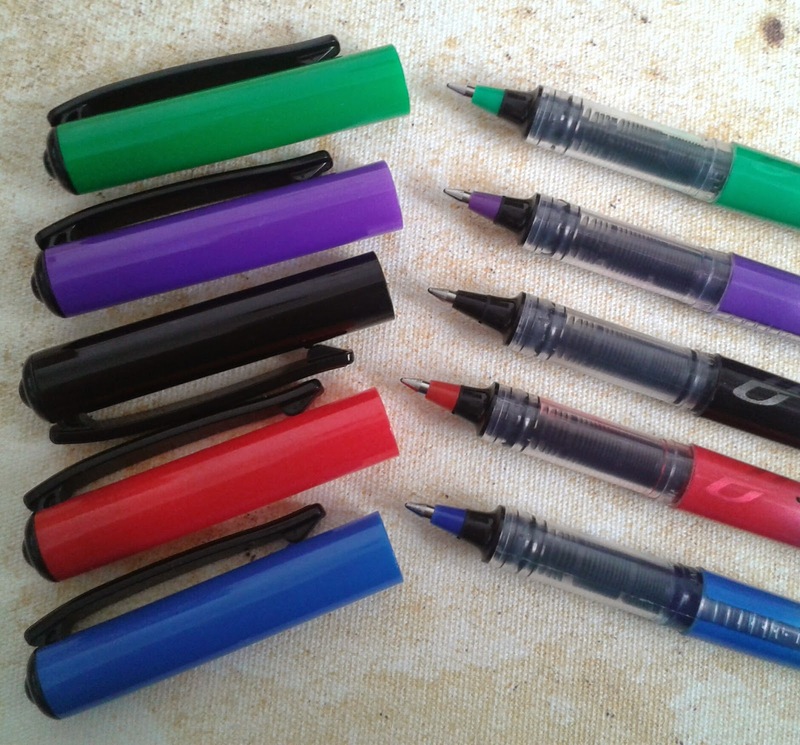 The pens are made of plastic with a rubber grip. They have a see through barrel allowing you to see how much ink is left and plastic lids with Hybrid Gel Grip printed on them. The very first thing I noticed when I started using these pens was the positioning of the grip. I felt like they needed to be maybe 5mm closer to the tip. I like to hold pens quite close the the tip to gain better control. I found I was having to place my fingers half on and half off the grip which wasn't making it the most comfortable pen to hold so I immediately took a dislike to them. It wasn't long before I began to think that maybe I was a little quick to judge. The pens write very smoothly. They were gliding across the page effortlessly. There was no scratching and absolutely zero skipping. Most pens I use skip a little but often its so little that I overlook it as it's possibly just the way I write. I always write as if I'm in a hurry. But these Pentel Hybrids felt fantastic on paper. And after writing for a while, I realised I'd forgotten all about the uncomfortable grip and was actually enjoying the pens. They have a 0.8mm medium tip which gives me lovely clean lines and there is no blobbing. The colours are light enough not to bleed through the paper and dark enough for me to see them without straining my eyes as some light metallic shades can sometimes. The ink isn't particularly quick drying so that's something to watch out for if using them for crafty activities or cards intended for others. I deliberately ran my finger across the ink after writing a sentence and found that each time, it would smudge the last two or three words. The pens are refillable but trying to find somewhere that sells the refills has proved to be difficult. But at the price I paid I'd probably just buy a new set rather than faff about. 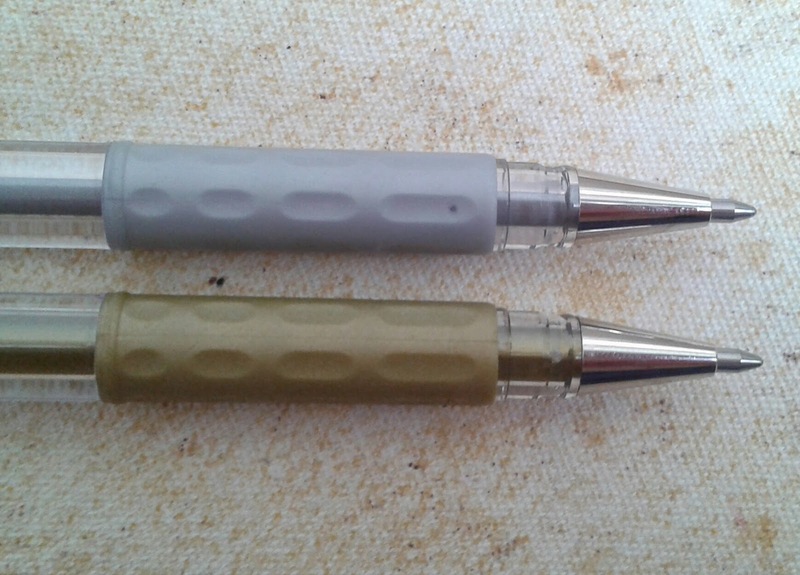 The pens are available in a range of different metallic colours which I intend to seek out at some point. The Pentel Hybrid uses 'Fadeproof and waterproof ink' which is quite important if you intend to use the pens for card making and so on. I don't know if anyone else has experienced this, but I find that sometimes if I display a card on the window sill for a few days, when I take them down the ink has almost disappeared. I may test this on the Hybrids and give feedback on the result at a later date. Despite my first impression of the pens, I've grown to really like them. Once I was able to adjust to the grips I was won over. 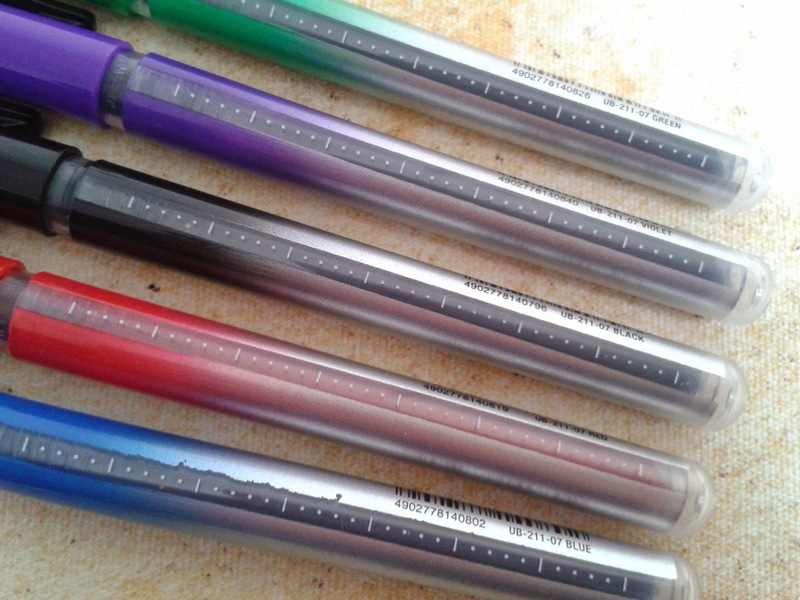 These pens are excellent for crafty people or anyone who loves to see fun, sparkly colours in their notebooks. 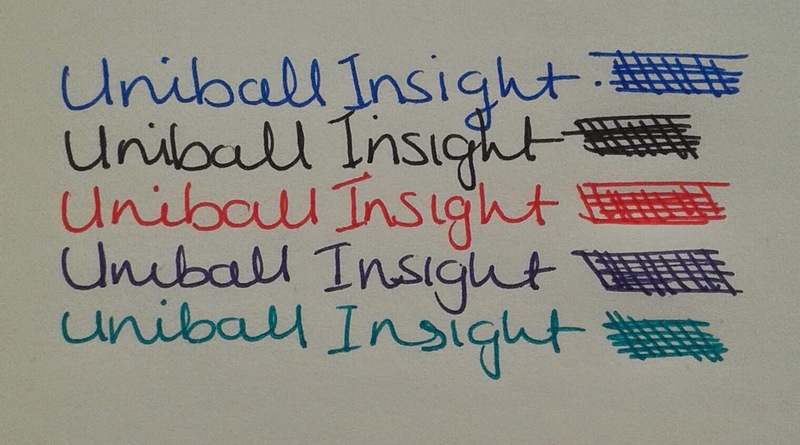 These are my Uniball Insight Liquid ink Rollerball pens. The bright colours immediately grabbed my attention. 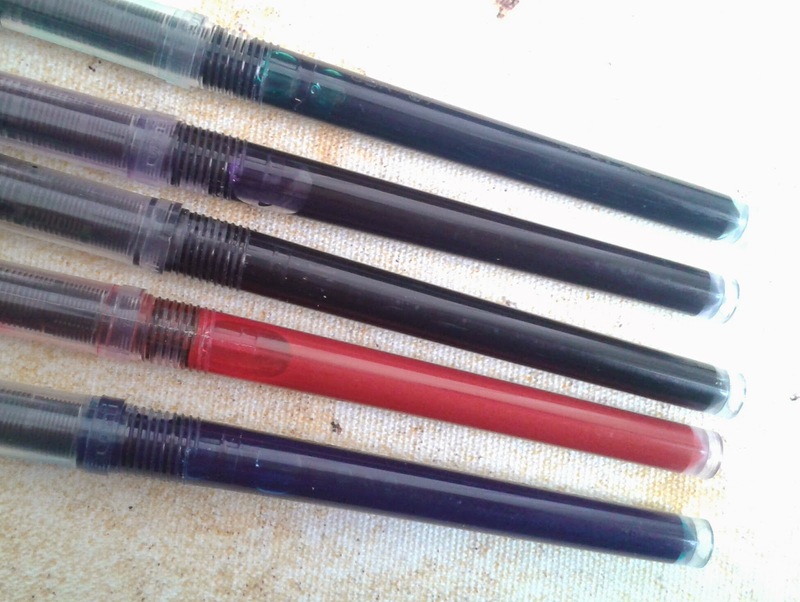 The pens are made of plastic and the colour of the pen is the same as the colour of the ink. Although wouldn't it be interesting if that wasn't the case?! Purple pen with green ink and green pen with red ink. I'll put it in the Uniball suggestion box, although I wouldn't be surprised if such pens existed already. When I realised that the same set which also includes a pink pen is available I felt a little sad inside. I think the pink pen and I would have got on like a house on fire. 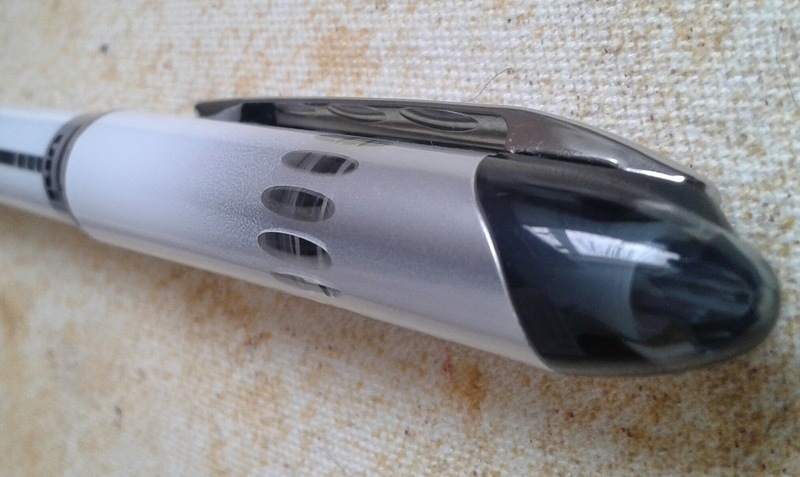 The pens have a stainless steel 0.7mm tip which gives you a 0.5mm line. The finer the tip the better for me. My handwriting looks a little less clumsy with a finer tip.The smooth plastic grip is slightly thinner than the barrel so my fingers slot in very comfortably with no slipping. The pens are lightweight and I don't feel the need to grip them tightly. The colours on the tip are a nice touch. The lids are very secure and need that extra little bit of strength to remove. 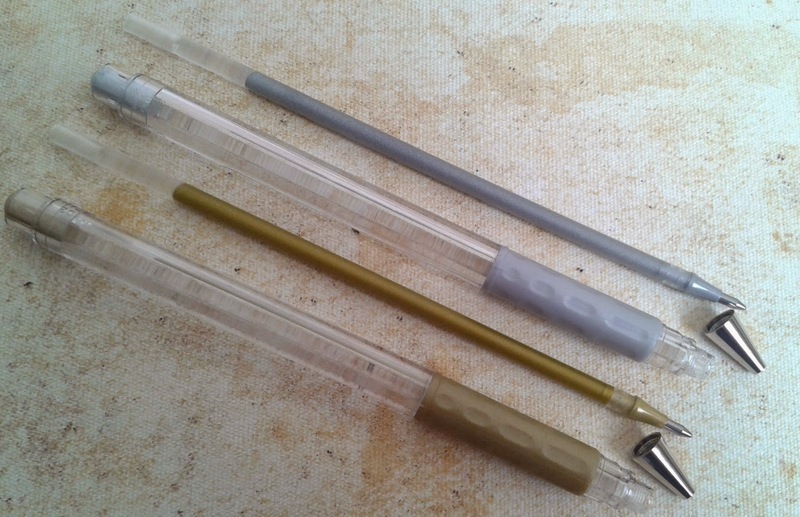 The pens have a see through strip on the barrel which allows you to see how much ink is left. Such a simple but very effective idea. It means I can see at a glance how reliable my pen will be at completing the task assigned to it. This pen speaks the truth and allows me to make decisions accordingly. 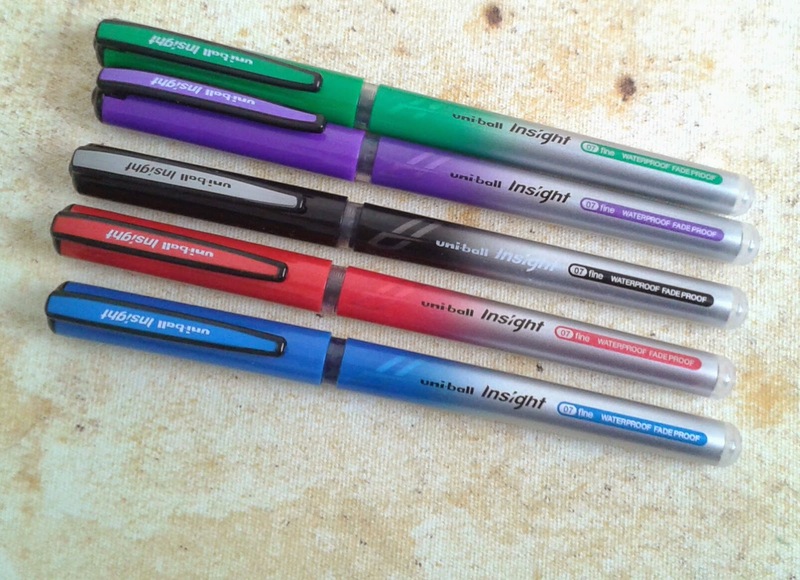 The Uniball Insight pens use liquid ink which flows from the tip beautifully. It doesn't matter how much pressure I apply, hardly any or pressing hard, the result is the same. It writes smoothly but theres just enough resistance on the paper to prevent the pen from running away with me. I love the ink colours. They are bright and cheerful although I would have liked the purple to be a little bit brighter so it stands out more.The pens claim to be waterproof and fade proof although I haven't actually tested this out for myself. The packaging states that "The ink will not wash out of clothing" so I'll take it's word for it. I'm not prepared to ruin a t shirt in an effort to prove it wrong. I'm now reassured by the strong lids as I definitely don't want accidental ink blotches anywhere knowing it will be permanent. The picture doesn't do the colours any justice but I wanted to show what I mean with the purple. The lids make me want to press them as if they were a magical button. Press down on it and your child will be ejected from their computer chair and fired off to the park to actually play with real people and experience fresh air and sunshine. They are not actually buttons and don't actually press down but if they did, I'm sure thats what they would be for. 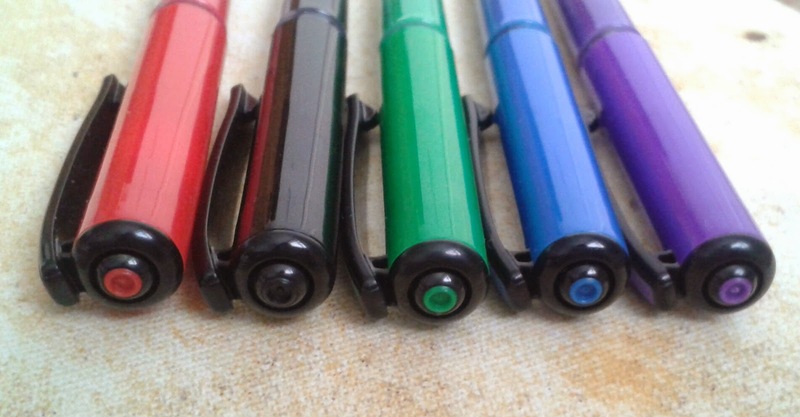 The Uniball Insight is fun, colourful and a pleasure to write with. This is a pen that I'd be happy to use for any occasion, be it doodling and making the most of the colours, or toning it down with the black or blue for a work assignment or letter writing. It ticks all the boxes. 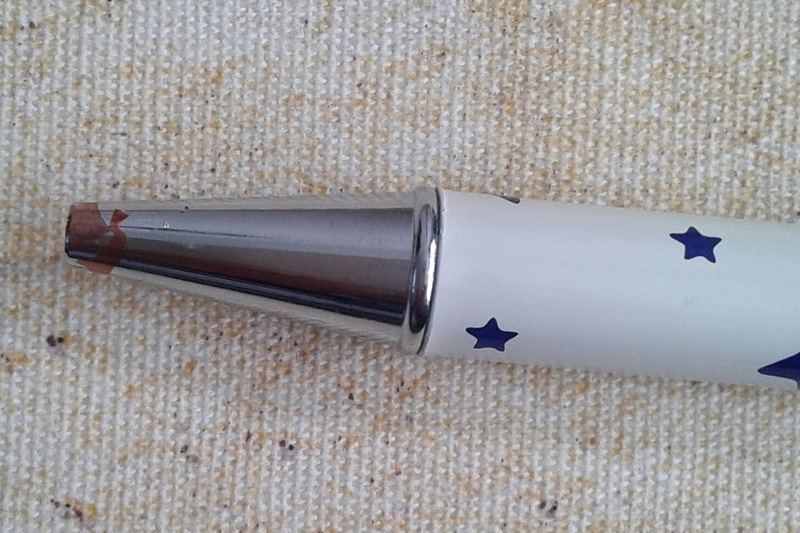 My Mum bought me this Emma Bridgewater 'Starry Skies' Ballpoint pen for Christmas. I'm a fan of the beautiful Emma Bridgewater pottery so I had high hopes and expectations for this pen. It looks very pretty. The blue stars really stand out against the white background. The pen is fairly comforable to hold but it can occasionally be a little slippery. I blame that on the way I hold it. I like to hold pens fairly close to the nib as it gives me more control. As the metal tip of the pen is quite long, its where my fingers end up, hence the slipping. It's smooth to write with and the ink flow is reliable.No issues at all with it's writability. The clip is quite bulky but attractive at the same time,with Emma Bridgewater stamped into it. It is a good, sturdy clip, holds well when attached to something. If you want to clip this onto paper I would recommend removing it very carefully. I found that pulling it off carelesslessy, as you do, causes it to mark its territory. I ended up with a scratch line in the paper leaving any detective in no doubt as to where the 'Starry Skies' pen has been. It looked like someone had pressed too hard whilst drawing a line and made indentations on several pages. To change the refill unscrew from the top, above the clip. Refills of this type are available from most good stationery shops. Unfortunately, not long after I had the pen the silver coating started peeling away from the tip revealing the copper colour underneath. It has been stored in a pen pot with many other pens, probably knocking together as pens are taken in and out on a regular basis. It's a shame as it really spoils the appearance. 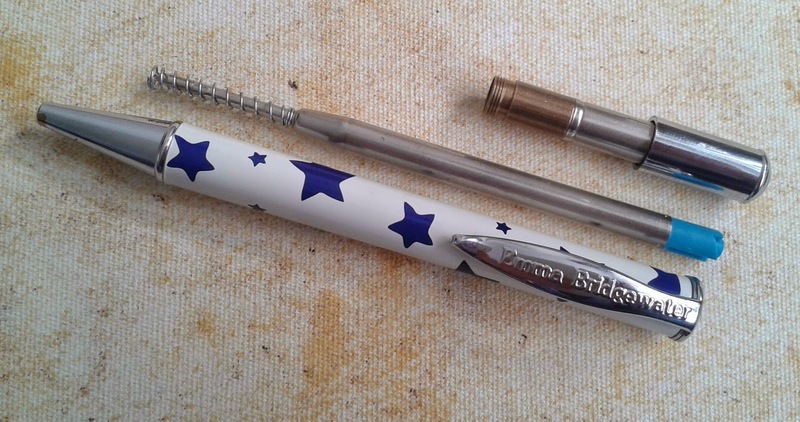 So there we have it, the Emma Bridgewater pen that I had such high hopes for. Visually, it has let me down slightly but to be fair to the pen, it writes well. It does what its supposed to do and it does it well. I expected too much so its flaws caught me by surprise. If I were to purchase another Emma Bridgewater pen I'd store it differently and hopefully it would remain pleasing to look at forever more. Behold the beauty of my very first Cross pen. I'd been eyeing it up for a while. The instant I saw it I knew it had to be mine. It's beautiful. The images really capture the imagination, reminding me of my childhood and my love for fairy tales and happy endings. The glossy lacquer finish is just perfect. This pen is also available in Light Blue but the Pearlescent Ivory won me over. It's an absolute joy to use. The ink flows perfectly and effortlessly, never letting me down. There's no gloopyness, it's smooth and consistent every time. It's quite a weighty pen but evenly distributed which is pleasing. I'm not a fan of having to constantly battle with a pen just to keep it in an upright position due to too much weight on one side or another. There's no actual grip but I don't feel as if this pen needs one. The shape, widening from the tip up makes for a very comfortable pen to hold. It's extremely easy to change the refill. You literally just gently pull the pen in half, unscrew the refill and pop a new one in. The clip bears the Cross signature and I love the cute little flick at the end. It's very secure. I'd clip this to my shirt with the knowledge that this pen is going nowhere until I unclip it. I haven't experienced any sliding about or frantically retracing my steps for a lost pen with this clip. Do I like this pen? I love it! I wouldn't use it for ordinary things like shopping lists or for work. It's too nice. I want it to stay clean and in perfect condition. It stays indoors for letter writing and diary entries. It brings out the dreamer in me. This is a pen for life!